We just returned from market and awaiting great new finds for the season ahead! Just in are these beautiful sterling silver Navajo Pearls in three different sizes all single strand. 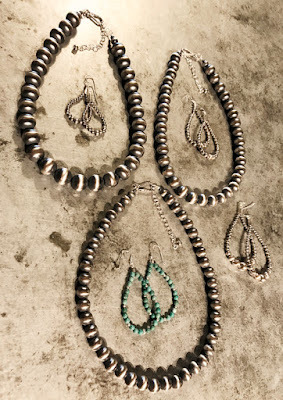 These are a staple that I wear every day they are great worn by themselves or to put a beautiful pendant on. Layer them with other multi strand necklaces as well they are beautiful!! 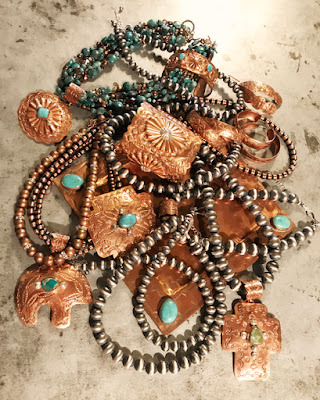 Love them mixed with all of our copper pieces by one of our favorite New Mexico silversmiths. Remember we have layaway for our jewelry please don't be afraid to ask! Please come in to see some of these beautiful pieces!